An intravenous pyelogram (IVP) is an x-ray examination of the kidneys, ureters and urinary bladder that uses iodinated contrast material injected into veins. The procedure is used to visualize abnormalities of the urinary system, including the kidneys, ureters, and bladder. An injection of ‘X-ray contrast medium’ is given to a patient via a needle or cannula into the vein, typically in the cubital fossa of arm. 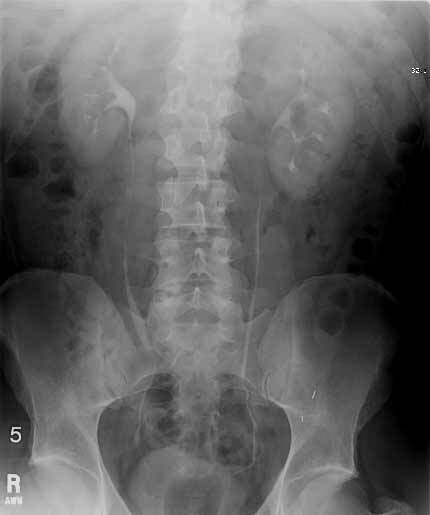 The contrast is excreted or removed from the bloodstream via the kidneys, and the contrast media becomes visible on X-rays almost immediately after injection. X-rays are taken at specific time intervals to capture the contrast as it travels through the different parts of the urinary system. This gives a comprehensive view of the patient’s anatomy and some information on the functioning of the renal system. Any obstruction in the system is visualized.